Milverton Conservative Mennonite Fellowship, 2004. Milverton Conservative Mennonite Fellowship in Ontario began services and formally organized in 1970. The first building was occupied in 1970. The congregation originated through division from Bethel Conservative Mennonite Church. Initially the congregation was part of the Conservative Mennonite Fellowship (CMF). In the late 1990s, the CMF congregations became part of the Nationwide Fellowship Churches. The first ordination was held in August 1970 with Dannie Gascho and David M Fisher being ordained as ministers. Ralph Gerber served as deacon until being ordained as bishop in 1973. Delmar Lichti was ordained as deacon in 1975. In 1978 Harold Gerber was ordained to serve at the outreach in the Kenabeek area and in 1994 Reuben Derstine was ordained as minister for Guatemala. Gerry Wagler was ordained as minister in 1996 and in 1999 Dannie Gascho was ordained as bishop. A former school building was purchased in Millbank and in 1971 a school began with two teachers and 34 pupils from grades one to eight. In 2018 the ministerial team included Bishop Dannie Gascho, Minister Nelson Gerber, and Deacon Delmar Lichti. When the Bethel Conservative Mennonite Church closed in 2014, the Milverton Conservative Mennonite Fellowship took over the Bethel building, and adopted the name, Bethel Conservative Mennonite Fellowship. In 2017 the former Milverton building was used for theater productions. Directory of the Northeast Fellowship. Aylmer, Ont. : On Eagles' Wings Publishers, 2017: 11. Thiessen, Richard D and Sam Steiner. "Bethel Conservative Mennonite Fellowship (Millbank, Ontario, Canada)." Global Anabaptist Mennonite Encyclopedia Online. November 2018. Web. 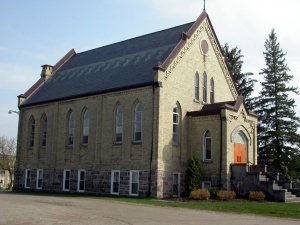 22 Apr 2019. http://gameo.org/index.php?title=Bethel_Conservative_Mennonite_Fellowship_(Millbank,_Ontario,_Canada)&oldid=162446. Thiessen, Richard D and Sam Steiner. (November 2018). Bethel Conservative Mennonite Fellowship (Millbank, Ontario, Canada). Global Anabaptist Mennonite Encyclopedia Online. Retrieved 22 April 2019, from http://gameo.org/index.php?title=Bethel_Conservative_Mennonite_Fellowship_(Millbank,_Ontario,_Canada)&oldid=162446. This page was last modified on 18 November 2018, at 13:05.